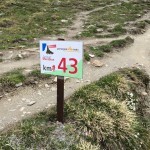 The weather forecast had not looked too promising all week – rain and cooler temperatures were called for, but the night before the race that changed to mostly cloudy with a chance of sun. The weather though would not keep most people away. They had made a commitment and were in this, rain or shine. 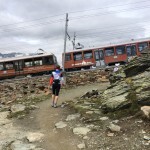 Early Saturday morning in Zermatt, while most were either still sleeping or packing their rucksacks for a day in the mountains, a few thousand put on their lycra shorts, compression socks and functional t-shirts for one of the most beautiful races on earth. 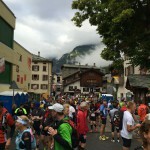 And then shortly before 9 they were lined up in the town of St. Nikloaus some 20 kilometres away from Zermatt. In their t-shirts of neon green, electric yellow, fire-engine red, royal blue and almost any colour imaginable. Most of the shirts are a testimony to an earlier victory in cities like New York, London, Berlin, the mountains of Switzerland, France, or Austria, or the sands of the Sahara and jungles of Costa Rica. Weekend warriors. A growing mass of people who have made distance running a major component of their lives. Ask any hundred of them why they do it and you’ll surely get a plethora of responses, but there is guaranteed to be some singularity in the answers too. Some of the most common answers will surely be health benefits, travel, stress relief, personal challenge, connecting with nature, and I’m positive that one of the truest answers is “I don’t really know.” That last answer to me is the proof that running is somehow inherent in people. It’s something 99+% of people can do, and like art, we can do it for its own sake: running just to run. 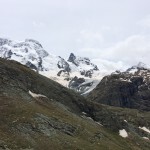 There is a feeling of freedom that comes with running, and if you read Running with the Pack, you’ll learn that running also helps turn the brain off similar to meditation, and interestingly enough helps your body create new brain cells, the old belief that our brain cells dye off and do not replenish themselves, has been disproven. That means while running you are increasing your cognitive potential while clearing your mind. That said this most recent race had me thinking about physics, well at least up to kilometre 30 or so. Along with the mental benefits from running, running is also in many ways a challenge. For those who don’t yet run, the thought of running is a challenge. Why would one want to leave the comfort of the home to go and run outside, only to come back sweaty and tired? Of course, the answers from above might be all that are needed to change one’s mind. Even runners though often find running challenging – be that making the time for it, or once you get into a habit of running, breaking the cycles in oder to increase speed or endurance. Running continually forces you out of your comfort zone. And no matter how disciplined one is, running always challenges physics. 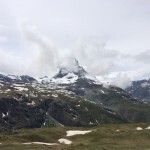 Let’s look at the physical challenges behind the Zermatt Ultra Marathon (simplified). 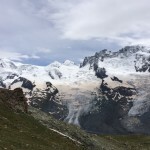 According to the Scouts, the way to calculate the equivalent kilometres done when an elevation change take place is for every 100m of elevation gained, it’s equal to an extra kilometre and for every 150 meters of descent with a gradient of 20%+ an extra kilometre. Now you may be wondering where the rational for this is. It has to do with gravity (9.8 m/s/s) which if you round it is 10 and multiplied by 100 gives you 1000. That is to say for every 100 meters you go up, you need about the same amount energy to go 1000m flat out, or conversely, it takes you about the same amount of time to gain 100m in elevation as it does to cover 1000m straight. Let’s continue to use the 5.07 pace for the second half. We then get that it should have taken me: 3:40 to complete the second half of the race. If I add both of the numbers together 2:12 + 3:40 = 5:52 and I came in at 5:59. So we see that the flat distance equivalent is fairly accurate. 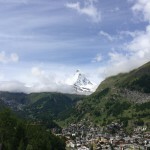 Meaning that the Zermatt Ultra Marathon had about the flat distance equivalent of 69.5km. As you can already make out, I completed the race just under 6 hours. At the half-marathon mark I knew I was doing well, but behind where I was last year. The start had been new having all of us runners start with a quick ascent onto some wider trail. Though it’s nice to not be on the road, having all of us on these trails so early on slowed us down. However, by kilometre 3 we were back on the classic route. The weather was holding up and rays of sun were fighting their way through the cloud cover. 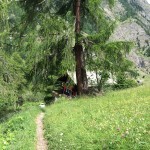 At Chalet Bergheim, at kilometre 25.5 I started fast hiking when my friend Tom and his brother caught up with me. We were able to stick together up to Sunnegga. Up there I needed to stop and get some fluids back into my system. Even pausing for just a few minutes makes starting again often quite difficult. Fortunately from Sunnegga there is a brief descent followed by some wonderful trail going up then dropping again into a flat bit. A few times I felt my calf muscle tighten up and start to cramp, but it was at kilometre 38 when I caught a stone with my toe, tripped and rolled over that my calf turned into a stone seemingly paralysing my left leg. Fortunately, a fellow runner stopped and helped me stretch it out and gave me the tip to run backwards for a bit to loosen it up. Easier said than done on a trail, but there was a flat concrete bridge on which I did just that. After rounding around Riffelalp the course went up. Marking up the gallery was brutal as always, and I felt like I was losing time each minute. At kilometer 42 I caught up with a Finn. He’s been battling leg cramps himself, but was totally immersed in the scenery. We ran together for about a kilometre until he sent me on my way saying that he was slowing me down. He did make it to the top finishing some 8 minutes after me. In comparison to last year, the way from kilometre 42 to 45.5 was nicer. 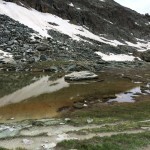 It was pretty much completely free of snow, which meant the trail was more technical and nicer to run on. 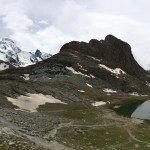 The temperature was, however, also much cooler with just 6 degrees on the Gornergrat as I arrived. 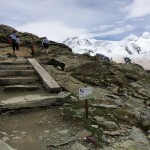 Crossing the finish line on the Gornergrat is also a hard finish. 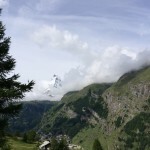 Unlike with the Dolomites or other races you have to climb up to it. Few run into the finish. Crossing the line though, I was pleased to find out that I was still under 6 hours. My energy levels were generally quite good and the Guggamusik got me pumped too. 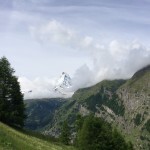 Best of all, though I was ready for it, it didn’t rain and, though the Matterhorn was not out in its full glory the lighting was magnificent. 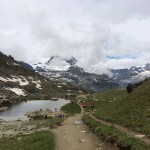 This entry was posted in Mountain Running, Race Report, Switzerland, Valais, Zermatt, Zermatt Marathon and tagged Equivalent kilometers, Leistungskilometer, Matterhorn, mountain running, Weekend Warriors, Zermatt Marathon 2014 by Christian Langenegger. Bookmark the permalink.